I had an exciting break through today. For ages and ages I have been trying to work out how to add the Victory threads to those colour charts in digitizing programmes. It has all seemed much too difficult - but today with the help of my Digitise-wise module, I conquered it and have managed to create my own Victory thread palette of 20 colours for starters. I am so pleased with myself for it means that when I am digitizing I can just select my own threads instead of fudging with other brands. 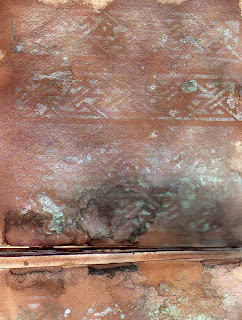 I have been doing a tiny bit on my ink book - I mixed polished pigments with gum arabic and then into the walnut ink mix. It just gives a special mica extra. I painted a page and wrote on it using the mix. No time to scan it tonight. 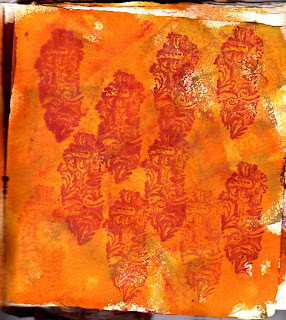 This page below I have done a shiva rubbing and sprayed over the top with Moonshadow and walnut ink. The Shivas make a great resist. I also got a fabulous result by painting my Air New Zealand paper towel (the one which comes with the meal) with metallic gold and then spraying walnut ink over the top. The texture of the towel shows as well. 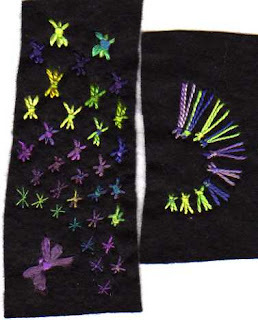 I was sorting some flower stitch foot samples for Christine as she is writing an article for a mag and I found this one. I needed a quick pic to see if this is what she wanted. 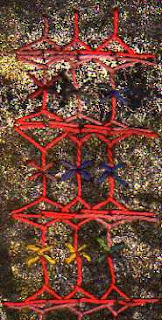 There are flower stitches on flower stitches - I will take a few closeups when I have time next week - it's quite 3 dimensional and some have been burnt out with a soldering iron. Great foot and great fun. It's still raining and stormy here. Last night walking back from Eva and Malachy's late at night (only a few blocks away) we nearly got blown away by the wind and we managed to get almost as wet as at Eden Park. And our little umbrellas struggled all the way. Incidentally, I am glad you liked my 'rainlets'. Hilary - it just popped out but I rather like it now. Last night they were very big rainlets. I run in and out in between jobs (still lots of packaging to go) to see how my next little experiment is working. 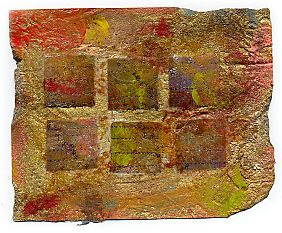 This little one was the wonderful Brusho page - I painted acrylic wax over the top and lost a lot of colour but when I stamped with gold metallic paint, the colour came back in places and I rather like it now. This one I really love - I have painted with walnut ink and sprayed moonshadow mist - misty malachite -over the top and then crumpled glad wrap. 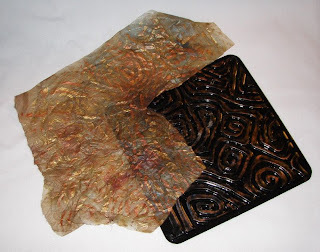 The colour is more patinated in real life but I didn't seem to be able to change it on my scan (see my scanning is improving and I have been doing it all myself) On the left is a water soluble paper cast using one of the wooden blocks I picked up the other day. It was painted with walnut ink once it had dried and then when it dried again I sprayed some of the Mist over it in places. 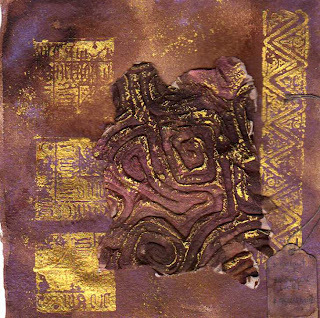 This third one - I painted Walnut ink on, left it to dry and then sprayed with Mist -Volaceous Violet this time and then I printed with gold metallic paint. The water soluble paper cast has had the same treatment with gold paint gently rolled on. Some of the tissutex I have been spraying with recently (often as an under sheet to supposedly protect surfaces) had gold paint gently swept over it as well to clean the brush. That's actually for my Rust book which is taking back position at present. It's good to see things coming together. My book seems to have pages all over the place so it needs binding down the middles as well. The one thing I hate about the Moonshadow Mists are the long names. Wonderful wonderful rain here - just love it. We have had a leak though which shows how heavy the rainlets have been. We have had quite a relaxed sort of weekend although quite busy. I am trying to get an amount of packaging of goodies done for the Craft Show here in Perth this coming Friday, Saturday and Sunday. I think I am getting through my list. We have a big stand and will have most of our stock with us so if you are in Perth or going to be around this way, do come and see us. I should add that there is free parking at the Claremont showgrounds - a sort of amazing fact these days. Our special guest is Beryl Taylor and I am really looking forward to meeting her. 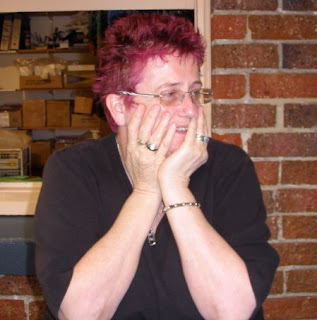 She is giving talks at the show (as am I) and 4 day workshops afterwards. 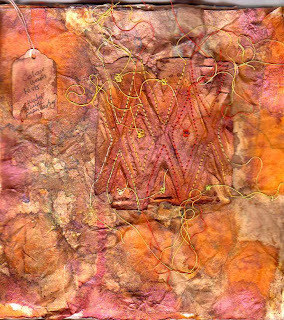 Beryl's book, Mixed Media Explorations, is one of our biggest sellers. Very inspiring book it is. I have also actually written a newsletter which should go out tomorrow to all of our customers who receive it - I hadn't realised just how tardy I had been on that score. 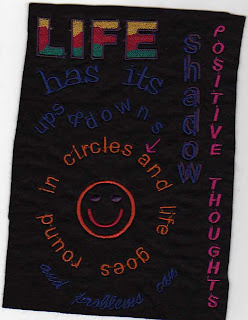 We have been having the most glorious rain off and on all weekend - we did manage to go for a walk yesterday but I have been working away on the next module of my Digitwise course and have finally worked out how to load my Victory threads into the Generations programme. Someone asked about the course - it is based on the Generations digitizing programme which I find suits me. I can get my head around it. I have also been further working on my Ink book. 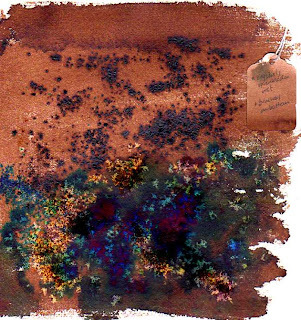 This sample is Walnut ink - quite a strong mix and with water flicked onto the wet surface. This sample has salt sprinkled onto the top section and on the bottom part I have stamped with Distress inks just before it dried so you get a slight smudging which I like. It looks better in the flesh. The bottom sample has walnut crystals at the top and on the bottom I have sprinked brusho powders. They are so lush - I got carried away with the turquoise and dropped too much. I have also made some paper casts with water soluble paper - painted walnut ink on after it dried and then sprayed with Moonshadow Mist - Misty Malachite - I am very pleased with this one but it's not dry enough yet - I will post it tomorrow. 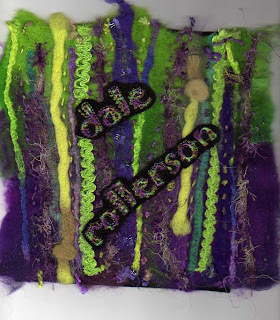 I am hoping to have my ink book pretty full so I can show it at my talk along with my embellisher stuff. I haven't done much with my embellisher this week but I have been making a lot of notes of what I want to do next. My sample book is also progressing to completion. Tomorrow I am off to collect goodies for Beryl's workshops. One thing I cannot find is wallpaper. We are having the most wonderful wet weather - I know this is not appealing to those poor folk in England but it is lovely here - just the right weather to work indoors, cuddle up in bed and sleep all night. Such bliss. And not standing outside at the rugby either! 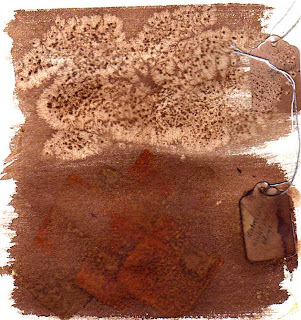 I have been playing with distress inks and colourwash today. The above one is stamped with distress inks using the lava mini molding mat and then sprayed with butterscotch colourwash and the bottom one is stamped with several distress inks straight from the pads with a colourwash over the top and then more stamping - I am looking to see the different effects when the distress inks are still wet and when you stamp on wet colourwash. More playing tomorrow. Off to dinner with Serena and Frank. We had a great weekend in Auckland. It was a spur of the moment thing - Ian realised he hadn't seen the All Blacks play in an international since around 1958 (yikes...) so we matched tickets to the game with air tickets and off we flew. We stayed in Newmarket and basically didn't go far. Lots of walking and looking in shops - something we never get time to do normally. Each visit of mine to a shop is matched by watch checking. Ian never goes into shops. 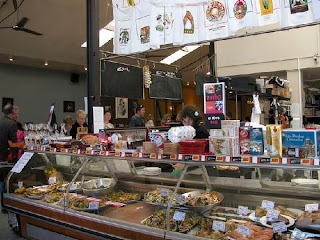 We really enjoyed Newmarket though and found a great restaurant - Safran - just off Broadway. Very nice food and great people. We had breakfast every morning at Zarbo. We also visited Trelise Cooper's Kids shop - just as well we haven't any little princesses of our own or it would have been expensive. Ian spotted a princess inside looking very happy. 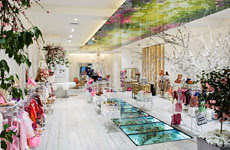 The shop has a wonderful glass section on the floor with all sorts of little happenings underneath and the 4 change rooms were to die for. I love Trelise's designs. Very inspiring for my little art to wear efforts. You can see the glass section in this pic. And also the ceiling area above it. Quite a little fairyland. The rugby of course was excellent and the fact that we got soaked to the skin didn't really matter in the long run. We bought $2 raincoats and had seats in the non covered area and the heavens simply opened up just before it started. I heard that the Tuba player had to be taken off the field before he drowned. Saw the thunder and lightening on the tv replay so yes - fireworks were great! And the result was excellent. Roll on the world cup. 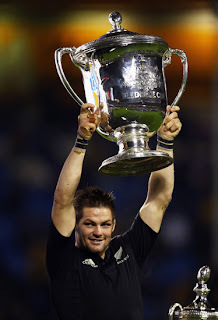 Here's Richie with the precious Bledisloe Cup. 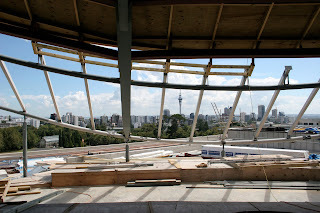 On the Sunday we went to the Museum to the Egyptian exhibition which was great and we got up to the events section under the new dome - the view was magnificent. We sat and luxuriated there for ages. 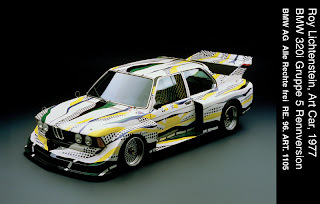 In the events centre was the BMW car display - this is Roy Lichtenstein's. We flew home on Monday - always seems to take forever and now we are back into the usual busy busy busy. I am hoping to get up into the studio tomorrow and back to my ink book and other stuff. We also bought a new slim and modern digital camera but we only worked out how to use it once we got home. Now we are thinking of getting a modern mobile phone as well. Having put it together, Ian is testing the new digital. Nice and small, we have entered the new age of digital cameras. 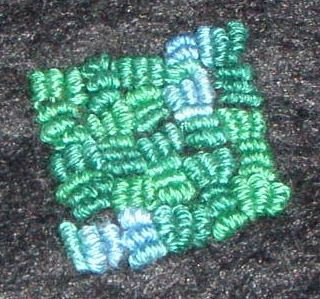 My bullion stitch effort at last - taken with my new digital camera. Kept me out of mischief on the plane. First time I have tackled bullion and I like it when it isn't perfect (my excuse). I used a 3 strand Valdani cotton floss. I am finally up to date again with TAST. 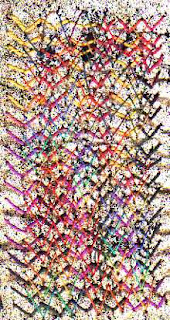 Here is my Arrowhead sampler. On gold foil background. I have stitched it first with a perle 8 thread and then over the top with a fine silk for a layer. It's a good stitch for borders. Just checking my mail at the airport and since I had to wait so very long to get to use this computer, thought I would sign in. We have had a wonderful relaxing time and the rugby game was something. Okay we got extremely wet even in our $2 raincoats and our feet and backsides were soggy, but the result was just what we wanted to see. Well worth the trip to see it all live and we managed to relax and wander to our hearts content. Preparing to get home and back to work in the morning. Now we are off to catch the plane to NZ. Back on Monday night. It's bit brighter than it actually is - this is what happens when I play with the gizmos on the scanner to try and show that I know something - but another page from my ink book. Background is tissutex coloured with colourwash and moonshadows and some paper casting with water soluble paper - sprayed with moonshadows while it was wet. I bought a pile of Indian blocks from a little shop the other day - I only went out to get the meat. They are great for paper casting. I thought I would try stitching with the Valdani cottons since we now have some an enormous stock so a new matt for me rather than shiny rayon. It's thicker too so it makes a good accent. 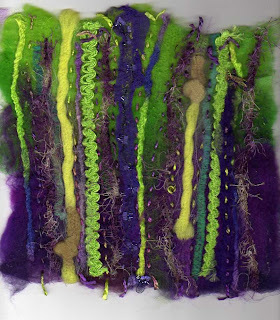 I am tidying up my studio because tomorrow I am running a workshop on the Embellisher for a few people. And then at 5pm we are off to catch the plane to Auckland. A few days sneaky break with an outing to see the ABs play the Wallabies for the last of the TriNations and the Bledislow Cup. It will be sure to be raining as we have not got under cover seats but who cares. We will have our umbrellas. If you are watching the game on the big screen look out for Ian with his All Black beanie....... We will be back on Monday night. Also catching up with friends and family. Half Chevron stitch - I had forgotten to load this one. Another new stitch I have never tried. Thanks to Sharon for this challenge. Still badgering on with the Bullions though. 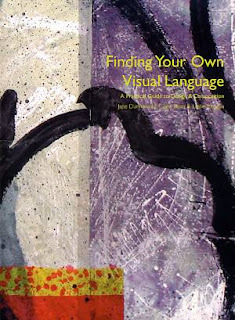 Copies of this fabulous new book from Jane Dunnewold, Clare Benn and Leslie Morgan arrived today. I have had a copy for a little while but didn't want to mention it until I got my order as so many people have asked for it. For all those people looking for more than just techniques (or dare I say it - projects) this is a superb book. One of my favourite books is Jane's 15 Beads (long out of print) and of course the bible - Complex Cloth - that's where I first found out about foils and got hooked on building layers on surfaces. Here is my offering for TAST 28 - Sheaf Stitch - I have tried to use a range of thread from fine to thick for a bit of gradation. You may notice I have skipped a number here - still plodding away practising Bullion stitch. When I think I have worked it out I will post my sample. Moonshadow Mists, Sue. Maggie Grey loves them too - sort of the move up from walnut ink with an extra zing! i have found that sometimes the spray gets jammed and won't. I keep the old jars and rinse them out so I can just swap over tops and carry on. Tour de France - we always enjoy watching the races - love the countryside - we have been following it since our first trip around France in 1992 . Sad to see that Stuart O'Grady had a crash on descent last night and is in hospital and Robbie McEwan has had to pull out as well. He had a big crash in one of the earlier races. Will miss keeping an eye out for both of them. I am always nervous when they go like a bat out of hell down hill. My Ink Book is filling up quite nicely - thanks Debbi for reminding about the fabulous Colorwashes. 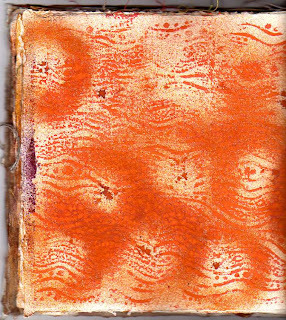 I sprayed this page with Butterscotch and Wild Plum (or Cranberry - I can't remember) and over the top Moonshadow Mists through a stencil and Moonshadow Inks with a stamp. You can see I am into fleur de lys this weekend - I was sorting product for Ian to load on the website. The Colorwashes seem to work very effectively on both fabric and paper so I find them most useful and there is something about a spray gun which isn't the shower cleaning container. They also contrast well with the mica of the Mists on top of them - dull vs shiny. This bottom one has been sprayed with various Moonshadow Mists and over the top I have stencilled with Glitz Spritz - Peacock Fire - the Glitz' don't have walnut ink so they work better on darker surfaces or again as a super contrast on the mists. 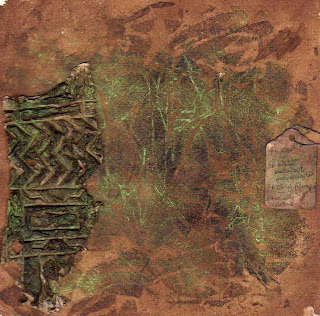 Peacock Fire has an almost patinating effect - it really is worthwhile making reference samples. You can surely see that I like using these goodies. The most frustrating thing with my Ink book is waiting for each page to dry. For all those of you wondering and worrying for the All Blacks, I am pleased to report that they beat the Springbox tonight - 33 - 6. It took them a long time to start scoring though. Always a worry. 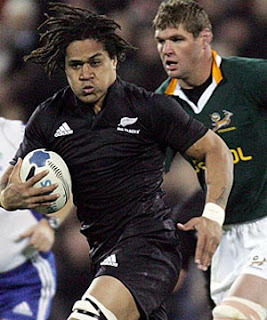 Next week is the last game against the Wallabies...... Here is Rodney - he had a good game. Yesterday I meant to add that nearly 2 years ago when we went off to England, we came back to a pile of sand on our front verge. Presumably it was for the studio - somewhere- but in fact it was never used. The building next door had sand delivered and our guys used that. So there we were with a pile of sand. On several occasions we prevented people from helping themselves but some of them sneakily managed when we weren't looking. Little groups of kids enjoyed playing in it and spreading it around. Then the underground power people have been and they mixed our good sand with the dirt they dug up, so we got them to take it all away when they filled the hole back in. So off to Sydney we went with a new flat verge and when we came back, another pile had appeared! Now it has moved next door. 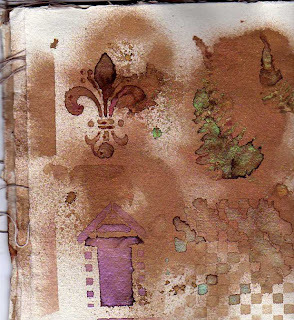 Here is a page from my Ink book - using stencils with the Moonshadow Mists. The top left is a Fleur De Lys stencil which just arrived today. 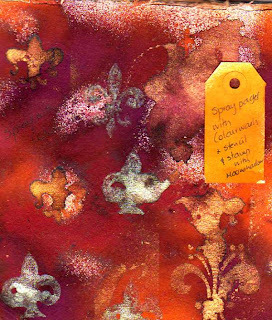 And here is a page of my tags sprayed with some of the colours. These Mists are so wonderful sprayed on all sorts of surfaces. Tomorrow I am going to use them on some water soluble paper with which I have been casting. 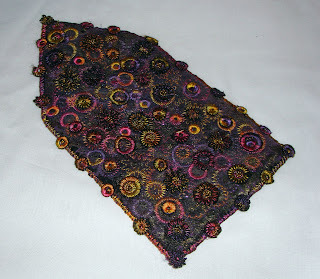 I am also experimenting with Evolon - the new buzz fabric - come back tomorrow and see what I have done. For more than two years we have been waiting for a tradesman to come and work on our front fence. With all the work going on next door, we have joined in the fun and our wooden pailings are down and the brickwork has had two coats and one to go. 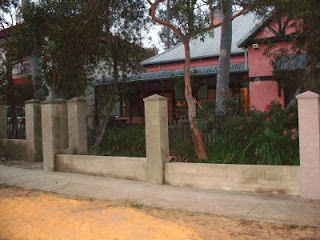 The front garden is full of rotten pailings and I think we are going to have a new gate and railings. Then we can really get to work on the front garden so it will look rather snazzy. In fact there's lots of garden work coming up. As well as this, all the side fences are down (there is development next door) and we are having a new colourbond fence going up. So we have securely closed double gates at the back by the studio but open and exposed everything else. In the midst of all this chaos (which includes the tradies loud radio on a station not of my choice), the palette came back from Sydney and I have been pottering away unpacking, putting things back into baskets, counting, reordering etc etc. 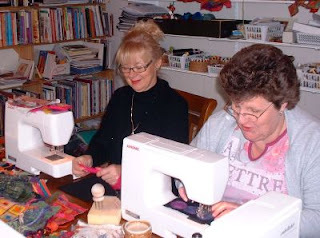 I have been to one Janome shop to give a demo/talk on the embellisher and another tomorrow. I can't say I have completed anything much creative but my little Ink book is starting to look like something - all my mist samples are in. If you are coming to the Perth Quilt and Craft show at Claremont I should have it in my talk (as a nice break from talking about the embellisher). Last night we went to the ACO concert - fabulous as usual - the guest conductor was Patricia Kopatchinskaja and she was superb. It doesn't matter what they play, they are so world class. Tonight we are off to a play. Culture week. Perhaps my long list will go down tomorrow and I might have some work to pop up. This one is Peggy McDevitt's - I haven't chosen any one over any one else - it is just that Peggy's doesn't have a surname with hers yet so I thought I would give her the honour! 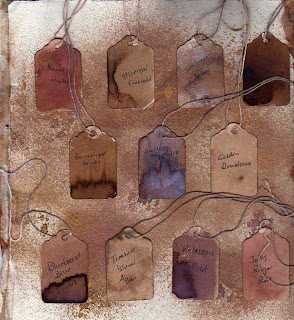 My Ink book is coming along - I have been spraying tags with Moonshadow Mists so I can keep a proper record of colours. I don't usually do this sort of thing. Bits and pieces of things achieved today. I worked on and finished Module 2 of my Digitwise course. All to do with letters and stuff. I stitched it out in colours they might not approve of so I may need to do it again tomorrow to send off. Module 3 looks more difficult but it is good to be doing it. I fear that I am behind everyone else for sure. 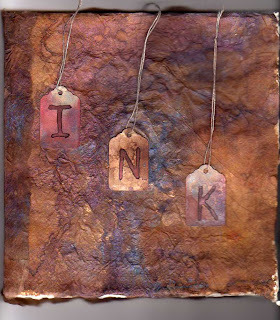 This is the front cover of my Ink book - a place to keep all my ink sampling - walnut, Moonshadow, Distress inks etc. I have written with the Moonshadow Inks - something new I have been playing with. I do love those Moonshadows. 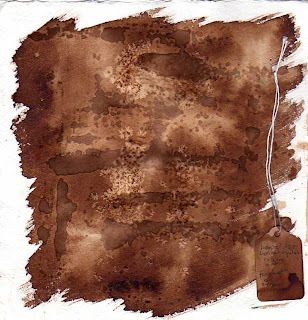 The background is Tissutex which has had various Moonshadows and Walnut ink sprayed on it.I use the Tissutex as a mop up or underneath other things when I am spraying. That way you always get unexpected results. 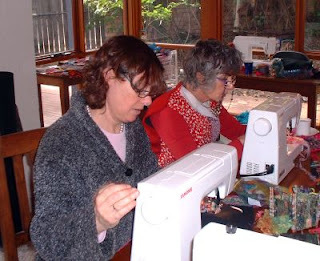 Getting ready for Beryl Taylor's workshops when she comes to Perth in August. Mareene tells me they are filling up quite fast. I think they will all be so inspiring somehow. Beryl has given me a rather large list of stuff to find. One is dryer sheets - do we have them in Australia? Do I need to scour the supermarkets? 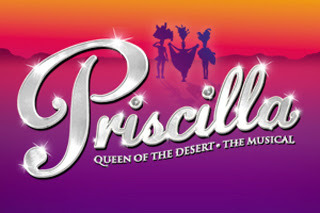 In Sydney, we went to Priscilla, the Musical. It was fabulous. The costumes alone were spectacular. We just loved it all. If you live in Sydney and haven't been - you really should. It's off to Melbourne next. 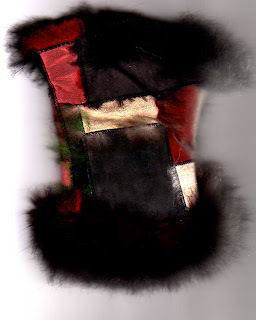 Here's the outside of one of my beloved possum gloves - keeping very close to me. Found the Indian cookbook so I can make the curry this morning but have to say the meal at Spaghi was lovely. There are 2 fabulous Italien restaurants in Perth - this one and San Marco - our friends Luigi and Martine. Sometimes I can't decide which is the better so I give them equal first for fresh, inexpensive and delicious pasta. We had a great time in Sydney last week. It's an awful lot of work though - you try to pack and package what you think people will want and you always run out of things which you have sent on ahead and of course when you get back you are missing stock which has either sold or is on the palette coming back. It's called Murphy's Law. However I have emptied the suitcases, reordered heaps of stuff, received parcels already. The palette (we sent 2 over and 1 back) will be here next Monday or Tuesday and then I have to unload it. And then reorder what is missing from that lot especially books. I hope all those who came to the show were impressed with our new book display in the coloured plastic boxes. Kept them all very neat and tidy. It was great to see so many familiar faces and we have the most fabulous staff in Lesley, Robin, Sue and Jill. They keep Ian and me in line. I didn't think there were nearly as many people at the show this year though - I think the nature of shows is changing. 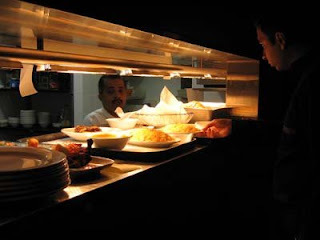 Lots of you asked which was our favourite Indian Restaurant - well the pic above is Zaaffran in Darling Harbour - we were able to name drop to the chef from GoGos in Perth and got an extra treat. It is a fabulous Indian restauarant and well worth the visit. That's the chef in the pic. We also went to The Opium Den in Potts Point with Jessica and had our favourite heavenly vegetables at the Golden Century. And Robin invited us home to her place for a lovely evening. I managed to lose my possum gloves when I left them at the Pumphouse and was heart broken but June Brown and Yvonne Voss made my day by retrieving them and returning them to me the next day. I was elated as I had been somewhat devastated. How could one get so attached to a pair of gloves? Didn't take any photos although Ian has photographed the Art to Wear which will make it to the web after a few very necessary jobs. Wait for the July Promotion - it is a very good one. I have been into the studio and all ready to start work tomorrow. Right now we are sneaking off to Spaghis for dinner - I was making a curry but I can't find the cookbook with the recipe Ian fancied - can you believe it? An awful lot can happen in one second. One second was all it took for NZ to lose race 7 of the America's Cup and that is that until the next one. The lead changed several times and NZ had a penalty from which we thought they would never recover but Alinghi fluffed it and the Kiwis got in front, did their 360 and almost got over the line in time apart from the one second. Oh well - all rich boys' toys. I find dinghy sailing more exciting. At least we can say we know a couple of the sailors on Alinghi. 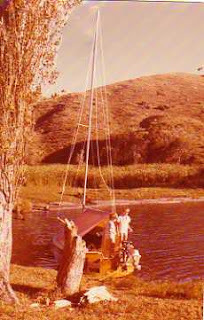 When we were teaching in Tokoroa, we used to sail a Monarch 18 on Lake Rotoiti every weekend in the summer. It went by the name of Flutterby! Hook up on Friday after school and off we went. Fish and chips in Rotorua and launch the boat with the boys inside in bed and sail around to our little hideaway bay with a torch to shine on the sails in case anyone came by, and a glass of wine in our hands. Below is the view we woke up to in the mornings. 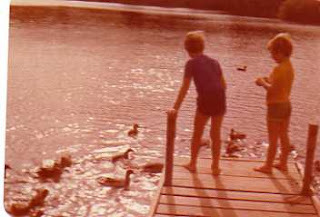 It was always a super weekend - you could sail to the hot springs on the other side and other regulars came most weekends as well, including the Phipps family - Dean is one of the Alinghi crew. 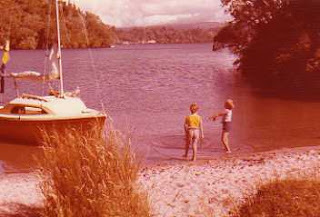 He and his brother sailed P classes and our kids went onto Mudlarks because we came to Perth. 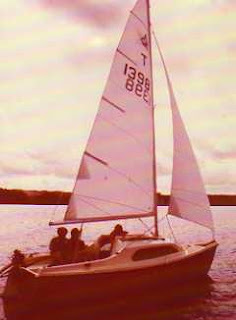 We did a sail on the Bay of Islands with them one year and had a wonderful christmas lunch on the beach drinking champagne and eating glazed ham. It was a great place for kids to have fun - we had our books to read and listened to the request show on Radio Rotorua or whatever it was and usually Badjelly the Witch read by Spike Milligan was requested. It was the first time we took part in yacht racing - for as you know whenever 2 yachts are going alongside each other there will always be a race - in fact that is the same with everything. We are all very competitive by nature. We were absolute amateurs never knowing what we were doing but getting there in the end. The other sailor on Alinghi is Murray Jones - I don't know him but Ian taught hin at Tawa College - now that was even longer ago. My TAST offering - wheatear stitch, french knots and long and short stitch. See - I did do some stitching while I was away. I worked on a piece of black felt which had painted webbing (Lumiere Olive Green) and i used a lovely thick silk we have for the centre, one of the Valdani Pearl 8s for the side, some green silk for the knots and some standed cotton for the long and short. My scanning is only slightly better. Tell you all the excitements of my week tomorrow - have unpacked all the cases but not put everything away and I have nearly done all the orders. Lots of stuff everywhere but that will be cleared up tomorrow for sure..... Wild wet and windy here - wonderful.